For years, you’ve been using a cordless drill/driver in just about every drilling and fastening application. It’s done the job. And it may still be the best choice for many applications, but there is another option. At first glance, an impact driver and drill/driver placed side-by-side seem similar. In fact, one could easily be mistaken for a smaller version of the other. But to anyone who has used both tools, there’s a world of difference not only in appearance, but in functionality. The key to a cordless impact driver is torque. While an impact driver may appear similar to a drill/driver, it stands on its own with a strong power-train system that delivers nearly three-times more torque – up to 1,350 in/lbs. Referred to as the hammer and anvil system, the power train is made up of the two namesake components. The motor-driven, spring-loaded hammer rotates against the anvil and strikes the sides of the anvil, which turns along with the hex chuck holding the bit. Striking at 3,200 blows per minute (BPM), this action is the driver behind the tool’s high torque output. An impact driver’s hammer and anvil system only engages when additional torque is needed, making it a versatile tool for all types of fastening applications. A drill/driver powers a constant 550 in/lbs. of torque at about 1,500 rotations per minute (RPM) with permanently engaged gears for high-speed hole drilling or driving simple fasteners. To deliver direct torque in larger fastening applications, a drill/driver requires the user to brace the tool or utilize a side-assist handle to help prevent it from rotating out of control. In these situations, especially after heavy use, most users become fatigued in their arm or wrist. In the case of an impact driver, internal mechanics help prevent torque from reflecting back into the user, an action commonly known as “torque reaction.” The impact driver traditionally requires less effort and only one hand to control. Since the weight of any tool over an extended period of time is enough to tire any user, keep in mind that on average impact drivers are nearly 50 percent lighter and 35 percent smaller than drill/drivers. The tool’s size and overall power offer an impressive and compact tool for varied applications. Hands down, the drill/driver is the most popular cordless tool available. From trade to trade, these tools have proven a viable solution for all kinds of fastening and drilling applications. But with the impact driver, a lighter, more powerful, compact and comfortable solution is available for fastening applications. Next to torque, the other term that should always be associated with impact drivers is fastening – the tool’s primary application. Whether installing duct work, sprinkler/fire protection systems, light-gauge steel framing, electrical boxes, concrete anchors, Tapcon® screws, deck screws or lag bolts for deck headers, many contractors who no longer use their drill/driver as the go-to fastening tool appreciate the power and comfort associated with an impact driver. And for reaching tight or awkward locations, such as during cabinet installation, the tool’s size can’t be beat. In the drilling arena, an impact driver is not the most efficient option, but it does offer some solutions. For example, the tool will drill smaller diameter holes utilizing spade or standard drill bits designed for the hex quick-change system. In a pinch, the tool offers a solution for drilling a few holes less than an inch in diameter. But for multiple larger diameters, drill/drivers are the best. When working with hole saws, large diameter spade bits, auger bits or other large diameter boring accessories, drill/drivers provide the constant speed and torque required to allow these bits to more efficiently cut through the material. HVAC contractors, carpenters, electricians and plumbers look to these tools to drill holes for venting, lock installation or for feeding wire, or to use step drills for connectors or self-feed bits for running copper pipe. Due to the higher torque at lower RPM ranges, drill/drivers also can be leveraged to mix substances such as concrete, mud and paint. Drill/drivers are applicable in almost all applications. But in a world where time is money, the impact driver simply completes fastening tasks quicker and with less fatigue. For impact drivers, the highest torque-rated tools will offer the best fastening performance. Features such as soft grip and variable-speed triggers provide added control for all types of applications, especially those that may not require as much torque. Most models come with an LED light for working in dim environments. Make sure it’s trigger activated, so it doesn’t drain the battery if accidentally engaged. In the case of drill/drivers, look for a tool with a heavy-duty all-metal gear box and steel-reinforced collar, a fast and powerful motor, dual speed capabilities (high and low), and a multi-position clutch. A shock-absorbing outer housing and one-piece power train, such as the Dura-Shield housing and Uni-body design Bosch offers, will help prevent against damage in the event the tool is dropped. Overall, whether purchasing an impact driver or drill/driver, the manufacturer should stand behind the tool with a free comprehensive service and warranty program. The key is to select the best tool for the job. And for fastening, an impact driver cannot be beat for overall comfort and performance. 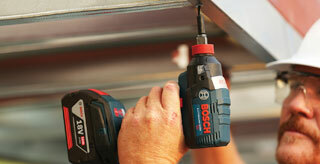 All claims regarding impact driver performance are subject to Bosch’s testing.